The last thing we want to do after gorging on holiday sweets and carbs is to dive head first into a bowl of pasta. 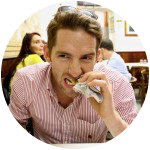 But how could we ever give up the divine world of Italian food? 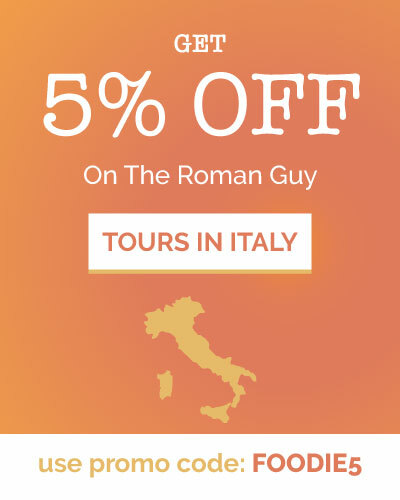 The good news is that you can eat light Italian meals while still experiencing traditional cuisine! That’s the real reason to celebrate this time of year, right? In order to eat a healthy Italian dinner you must remember one important detail: always use seasonal produce. This is a critical part of Italian cooking- if it’s not in season, you don’t use it. 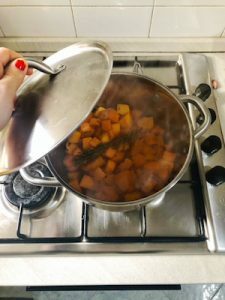 Thus, I share with you my healthy, vegetarian, Italian recipe for the winter. And yes, an Italian mamma did kiss her fingertips and joyfully throw her hand to the air (the stamp of approval that something is delicious). I am American and a proud member of the pumpkin obsessed club. Luckily for us devotees, Italy also has a strong pumpkin culture, as well. However, they celebrate the fall/winter treat a bit differently than in the States. For instance, instead of using artificial flavors in Oreos, coffee, and muffins, Italians use ripe pumpkins to make savory dishes. Among the most popular are risotto, sauce for pasta, and simply baked with a bit of olive oil and salt. Italian pumpkin season runs from October to late December/mid-January. During this time, supermarkets as well as fruit and veggie stands are full of whole or pre-cut pumpkin. In fact, Italy actually grows more pumpkin than the United States. Who knew! 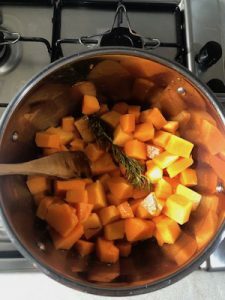 Although pumpkin was once popular in la cucina povera, food for the poor, it is now widely used and accepted throughout Italy. And, as each region prides themselves in gastronomic diversity, the types of dishes vary. For instance, you see more pumpkin risotto in Piedmont and ravioli di zucca in Lombardy. In Lazio, the region of Rome, you see a mix of pasta with zucca as well as baked slices with herbs and olive oil. Regardless of the dish, pumpkin is a champion. 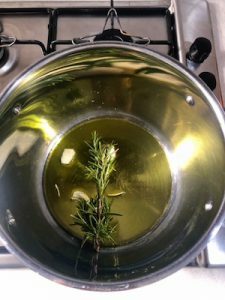 As hard as it was to choose one recipe to share with you, I decided on a typical dish my Roman boyfriend’s family often makes this time of year. Can’t go wrong with that, right? 1. Remove the outside skin of the pumpkin with a knife. 2. 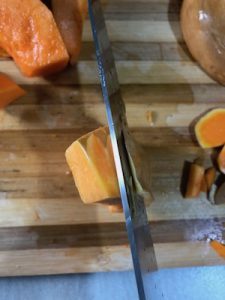 Cut the pumpkin into even slices then chop into cubes. 3. Heat 2 tablespoons of olive oil in a large pot or pan. Add the rosemary and garlic. I like to smash the garlic clove to allow the flavors to spread. 4. Allow to simmer for about 5 minutes or until golden brown. 5. Add the chopped pumpkin and salt/pepper to taste. Cook for 15 minutes, stirring occasionally. 6. During the last 5 minutes, cover the pumpkin and lower the heat. 7. Preheat the oven to 375 F or 190 C.
Remove the crust of the stale bread. Chop into small, even-sized cubs. Place 1/3 cup into blender or food processor. Add the parmigiano and sage. Blend briefly until you reach a coarse consistency. I left a few larger pieces in the mix. 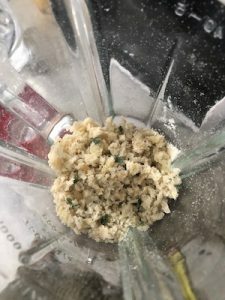 Remove from mixer and place in a cup for later. 9. 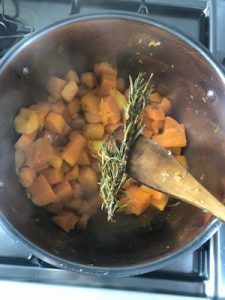 When the pumpkin is cooked turn off heat and remove the garlic and rosemary. Depending on your love for garlic, leave some of the small pieces. 10. 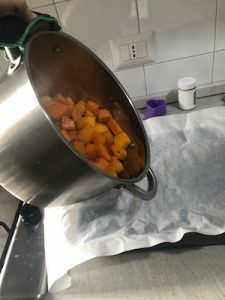 Transfer the pumpkin to a baking sheet lined with parchment paper. 11. 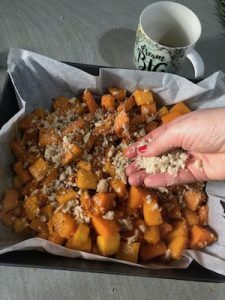 Sprinkle the breadcrumbs on top. I added a few of the left over cubes of bread at this point to add more texture. 12. Pour 2 tablespoons of olive oil. 13. Bake for 15-20 minutes or until you see that perfect golden color. 14. Leave to cool a few minutes, pour yourself a glass of wine, and enjoy!